Fashion is about reinvention and we have seen multiple times that everything old can be new again. Current trends for the new fall season have a heavy ’90s grunge influence and while the hunt has begun for the perfect plaid coat for when it gets cold (if only we had kept our entire wardrobes from high school) it’s the ’70s that is currently giving inspiration. This is a decade that embraced synthetics materials and some extreme power clashing and despite the many fashion disasters I find that I am drawn to this period. Maybe I have watched Almost Famous too many times. Having watched The Conjuring last week – the bits I did see when I wasn’t hiding behind my scarf – I now find myself hankering for some ’70s stylings beyond the polyester. Plaid is something that links the decades of glam rock and grunge; the recent Marie Claire Zooey Deschanel cover married these two eras and it is something that features heavily this season. So throw on a plaid shirt and pair it with the two items that begin TV Ate My Wardrobe’s fall wish list. 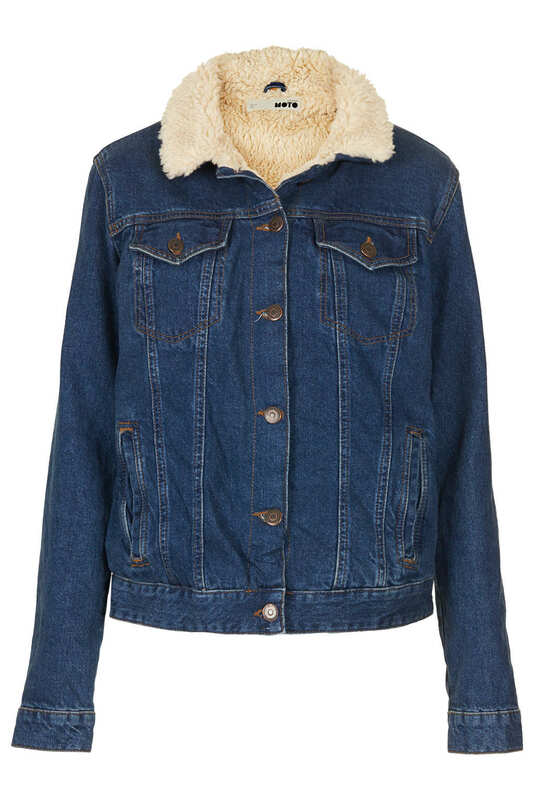 While an actual vintage denim jacket from the ’70s would be preferable Topshop offers up this great alternative. Over at Mr Porter this week they have a feature on denim jackets including Clothes On Film’s Chris Laverty discussing the role of denim jackets as costuming. Laverty mentions how the denim jackets in the ’60s became a symbol of youth in movies such as Easy Rider. In The Conjuring it is Roger, the father of the family (played by Ron Livingston) who is sporting a jacket similar to the one above so the youth factor isn’t so implicit but as a family there is a relaxed vibe (until the bad things start to happen). I had a pair of black flared cords when I was at university that were my favorite thing, that was until it rained and they got soaked up to the knees. 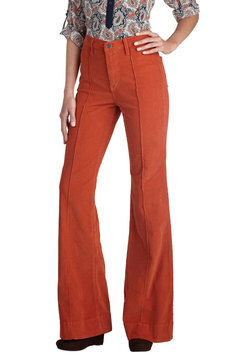 The flaring on those was pretty extreme and this pair from ModCloth has a more toned down approach. Except when it comes to the color, you can opt for the safe ocean (in the photo below) or if you want to truly embrace the ’70s aesthetic they are also available in the bold tangerine (above). 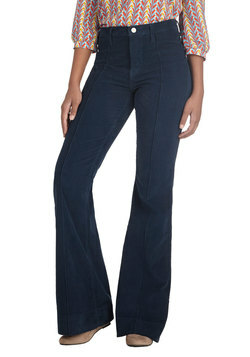 Your inner Penny Lane will love the exposed center seams and high waist; oversized sunglasses are optional. Bare feet might not be the best approach so either sandals for the end of summer or the more autumnal Converse would work as footwear for this look. What is on your clothing wish list?